Washington Sep 15 (IANS) US President Donald Trump is urging his administration to move ahead with slapping tariffs on $200 billion of Chinese goods according to an official. However the timing of an announcement remains unclear CNN quoted spokeswoman Lindsay Walters as saying on Friday. Trump met top aides earlier this week on the tariff issue and directed aides to proceed with plan. 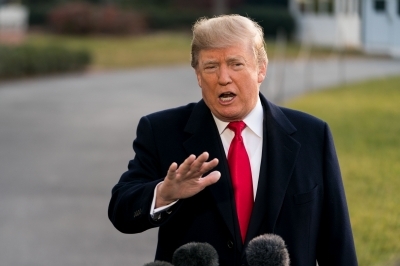 "The President has been clear that he and his administration will continue to take action to address China s unfair trade practices " said Walters. "We encourage China to address the long standing concerns raised by the US." "We are under no pressure to make a deal with China they are under pressure to make a deal with us " Trump tweeted. The threat came as Treasury Secretary Steven Mnuchin has been working to break a stalemate between the two countries in the hopes of ending the escalating trade war between the world s biggest economies. This week Mnuchin extended an invitation to China to resume talks before the newest round of tariffs are imposed. Trump s top economic adviser Larry Kudlow told Fox News on Wednesday that the US government had received information that "the top of the Chinese government wished to pursue talks" prompting Mnuchin to send an invitation. China welcomed the offer saying that both governments were discussing details for a new round of negotiations. The next round of US tariffs on Chinese goods is likely to make thousands of products including dishwashers Fitbit fitness trackers and food seasonings more expensive for American consumers CNN reported. The Trump administration has already imposed 25 per cent tariffs on $50 billion worth of Chinese goods. China which has accused the US of trade bullying has matched the tariffs dollar for dollar. Beijing has pledged to hit back again with tariffs on another $60 billion of US exports including meat coffee furniture and auto parts. Trade negotiations last month involving lower level officials from the two countries ended without any breakthroughs. Trump has also threatened another round of tariffs on $267 billion of Chinese goods. If imposed those tariffs would bring the total imports from China subject to penalties to more than $500 billion.